KIHEI — If Friday’s results are any indication, the Maui Interscholastic League boys swimming and diving championship is up for grabs next week. Baldwin High School, the seven-time defending MIL boys champions, won the meet with 46 points. King Kekaulike was just three points behind and Lahainaluna was 3.5 points out of the lead. 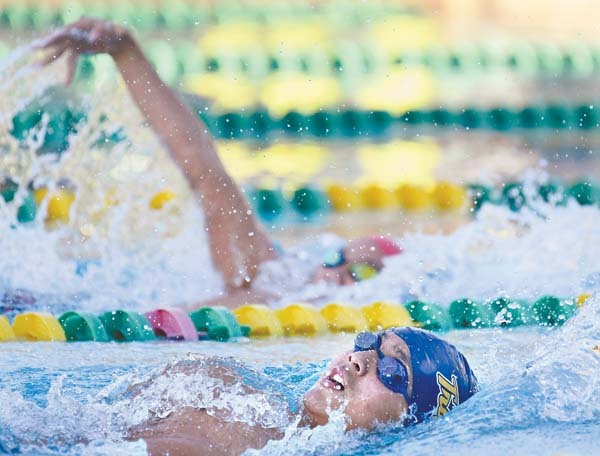 All three of those schools have won boys regular-season meet titles this season, as has Maui High, which was fourth Friday night at Kihei Aquatic Center with 24 points. Team lineups will be very different when entries for MILs are turned in on Wednesday, and relay team members can be juggled all the way up to the finals on Saturday. Still, it appears the race is on. 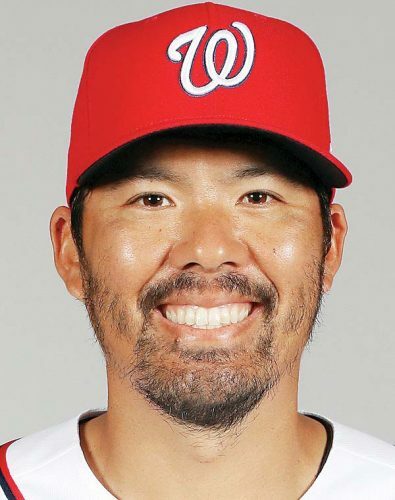 Yamamoto said entries will be key. 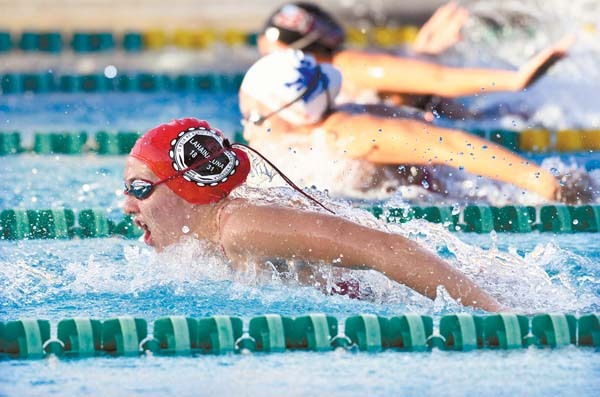 For championship meets, swimmers are allowed to enter four events, including no more than two individual races. No more than four swimmers from one team can enter a single individual event. 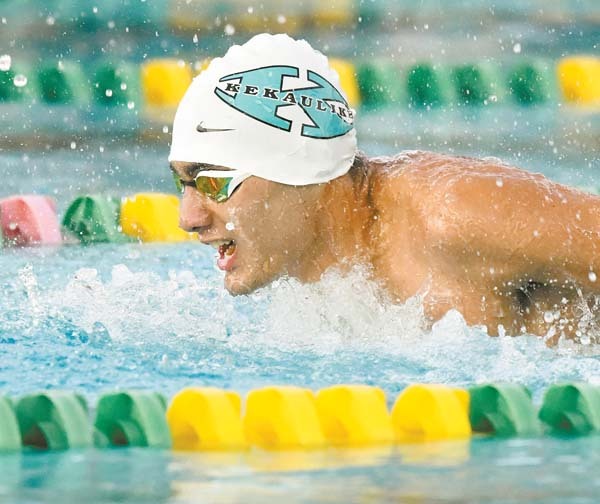 The boys individual races had just two double winners Friday night: Baldwin’s Vincent McNabb in the 50-yard free (23.18 seconds) and the 100 backstroke (56.43); and King Kekaulike’s Austin DeCambra in the 100 butterfly (54.24) and 100 breaststroke (1:00.59). Other individual boys winners included Maui Prep’s Slater Fleck in the 200 freestyle (1:50.68), Lahainaluna’s Jaden Yip in the 200 individual medley (1:59.78), St. Anthony’s Sean Cerizo in the 100 free (50.58) and Kamehameha Maui’s Kaeo Kaupalolo in the 500 free (5:25.45). DeCambra is a senior, all of the other Friday winners are freshmen or sophomores. Baldwin coach Arielle Obrero sees a race for the boys crown. The Bears’ girls have won the last 10 MIL titles and won Friday’s meet with 58.5 points, 14.5 in front of second-place Lahainaluna. 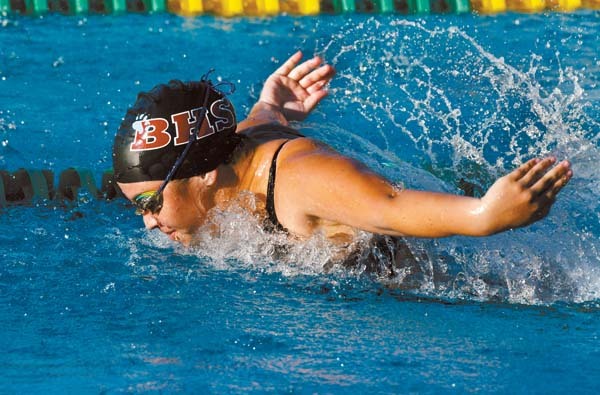 Lahainaluna coach Tom Popdan said the regular-season strate­gy changes dramatically for the championship meets. “There’s a lot of difference between the meets that are during the season and the ones at MILs because the two individual events and two relays is all you can do,” Popdan said. “The scoring is going to be different based on how each coach is focused on that one particular meet. So, I mean there’s a lot of parity and there’s a lot of good swimming in Maui. King Kekaulike coach Malcolm Cooper said his approach is simple. Cooper acknowledged that the competitors’ eyes will be on the team prize.